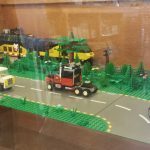 If you’ve been to the Aboite or Georgetown branches of the Allen County Public Library this month, you may have noticed that FortLUG currently has a few vignettes on display. Over the summer, we’ve been preparing for this year’s display season and we’re excited to share with you what we’ve been building, as well as some of our favorites from years past. 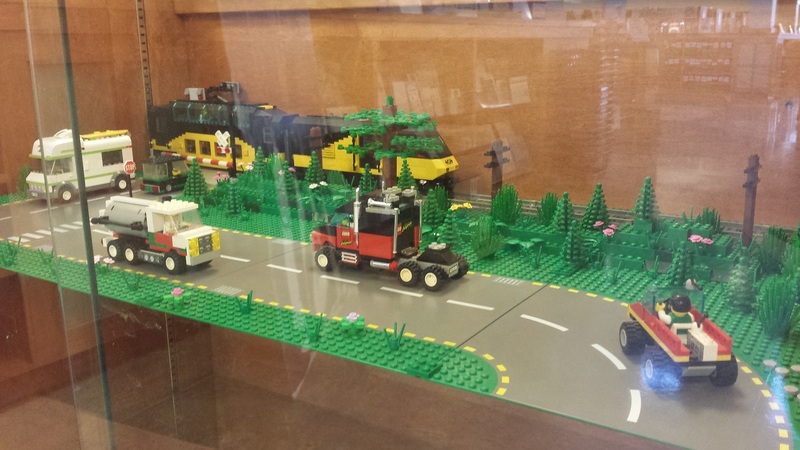 These vignettes will remain on display throughout the month of September, so the next time you’re at either branch, take a few extra minutes to check ’em out. 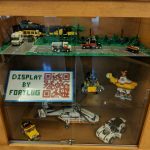 These displays would not be possible without the work of the following collaborators: Ed & Diane DeWitt, Mike & Joellen Child, Brandon Cochren, Greg Majewski, Chad Sharpenberg, and Geoff Ross. 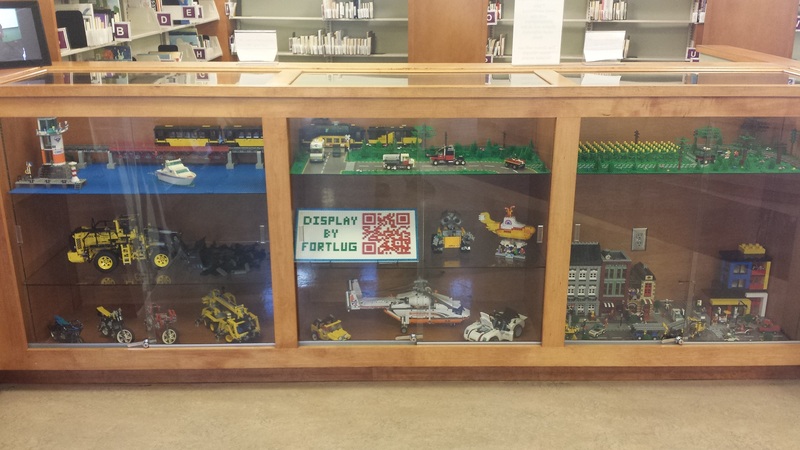 This is the first time FortLUG has had a display at the library, but it probably won’t be the last. This house was home to Diane’s grandparents. 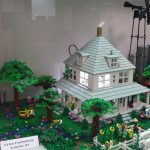 This MOC house is modeled after the farmhouse of Diane’s grandparents, which is located near Auburn, IN and was built around 1916-1917. The house was originally coal-heated, which is why the chimney is in the middle of the house. 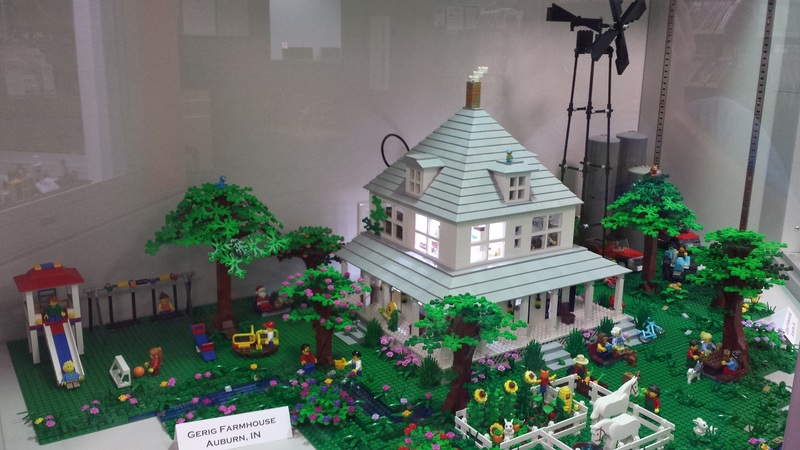 The model took 6-8 months to plan and build, and made its debut at Brickworld Fort Wayne 2016. Eventually, she would like to also build the rest of the farm’s other buildings. Diane remembers many fond childhood experiences on this farm. 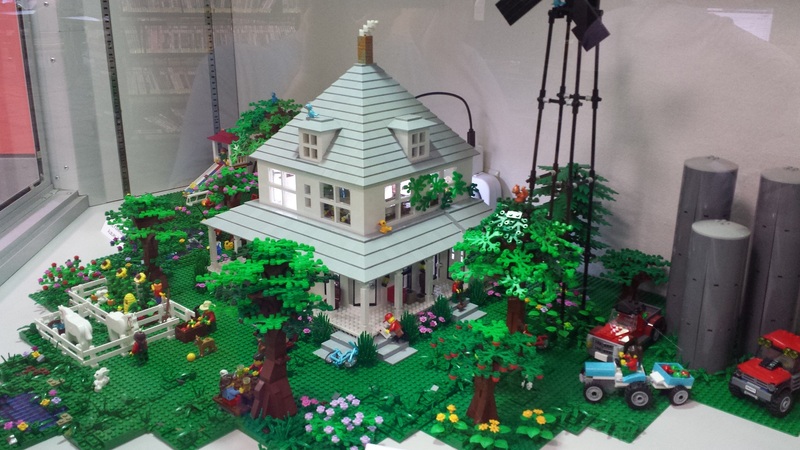 These buildings are “my own creations” (MOC), not official LEGO sets. 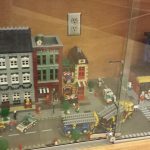 These four MOC City buildings have been built in the modular style so they snap perfectly together with any official set from the LEGO Creator series of modular buildings. 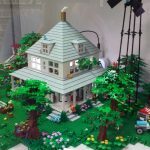 While they are LEGO inside and out, they are also “my own creations”, built without instructions straight from the imagination of the builder! From left to right, we have the Natural History Museum, a bike shop with upstairs apartments, the local Ristorante Italiano, and the brick-esque Billund Block, a combined shopping and residential space. 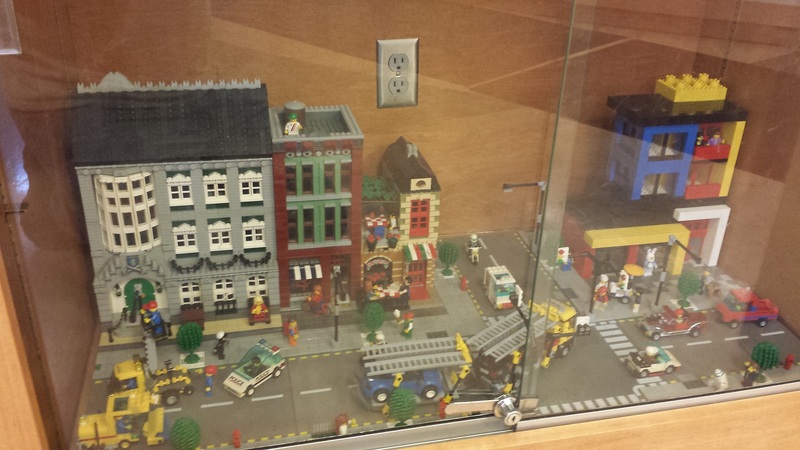 The name “Billund Block” pays tribute to Billund, Denmark, the birthplace of LEGO. A Volvo L350F hard at work. The Volvo L350F is hard at work, moving and shaping the the ground. 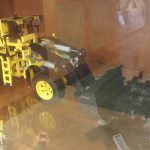 This 1636-piece official LEGO Technic set (42030) is remote-controlled, features real center-pivot steering, and a front scoop that can raise and dump. 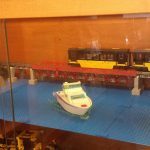 Unfortunately, LEGO has retired this model, so you’ll have to go to an aftermarket such as Bricklink or Ebay to buy one now. The New Nickel Plate Express and red bridge were designed on a computer. Coast Guard building built by Chad Sharpenberg. The New Nickel Plate Express carries travelers over a lazy river and through the countryside as a LEGO family has a picnic. This 1428-piece MOC train features a Power Functions and 9V hybrid locomotive and is descended from official set 4559 from 1996, the first LEGO train Geoff ever owned. The red truss bridge over the river contains 281 pieces and is functional as well as cool-looking. Both of these models were designed with Stud.io, a LEGO CAD software from Bricklink. 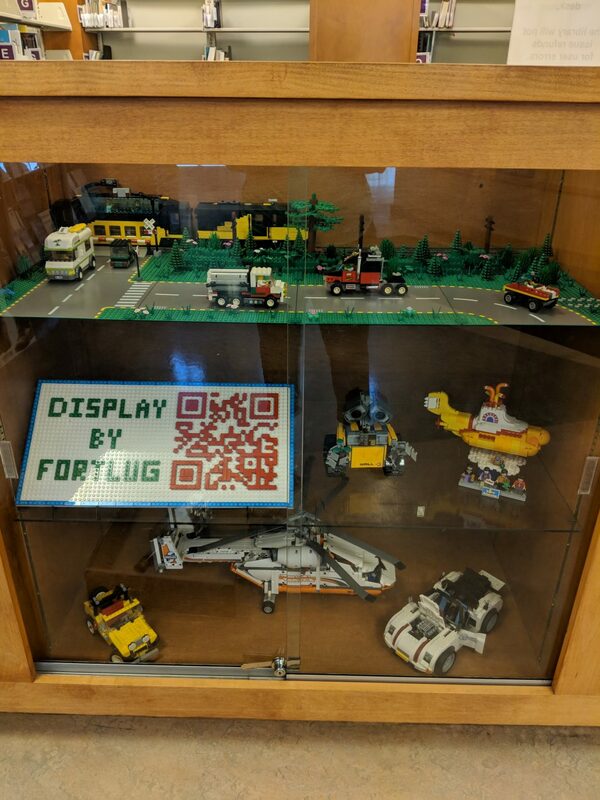 The FortLUG QR code and assorted Technic vehicles. 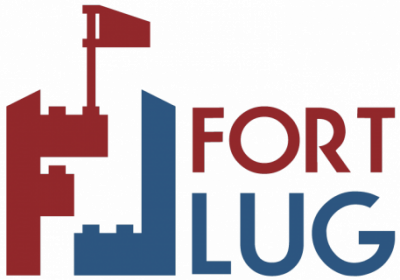 The FortLUG sign is a simple LEGO mosaic. Mosaics fill an interesting niche in the world of LEGO because they use bricks to model images rather than objects. They can be used to re-create all kinds of real-world images, from the QR code that brought you here to world-renown works of art like the Mona Lisa. Builder: Geoff Ross, Chad Sharpenberg, Brandon Cochren, Mike & Joellen Child. 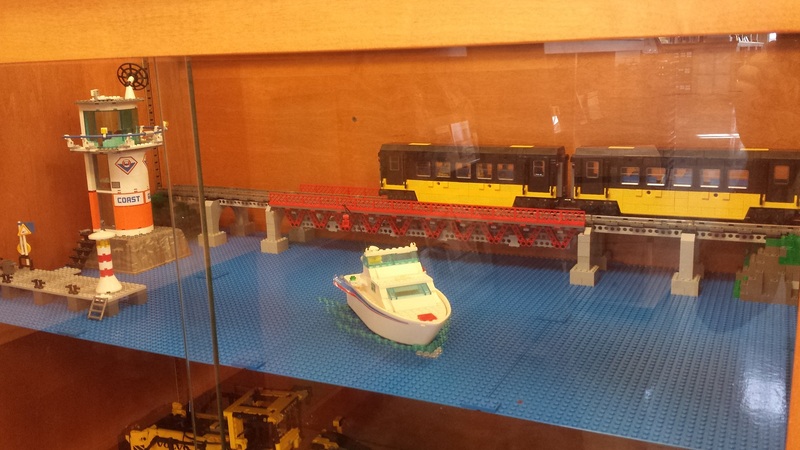 The LEGO Technic series was launched in 1977 under the name Expert Builder and was a huge success. The new sets featured gears, axles, pulleys, and other mechanical elements that appealed to the engineer-builder and which gave the models some functional motion capability. 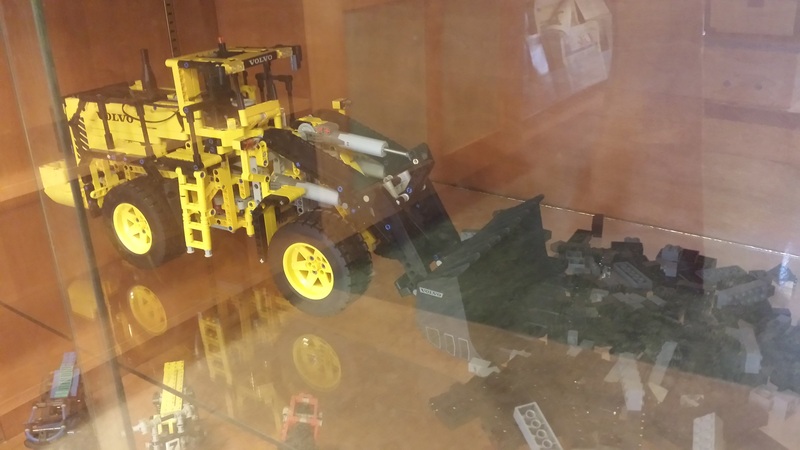 The Expert Builder series – and later, Technic – was and continues to be instrumental in drawing teens and older builders to LEGO. Thanks to all the collaborators who made these library displays possible. We’d also like to thank the public for the appreciation we’ve received for our work.